This is only for the ACTION TAKERS! 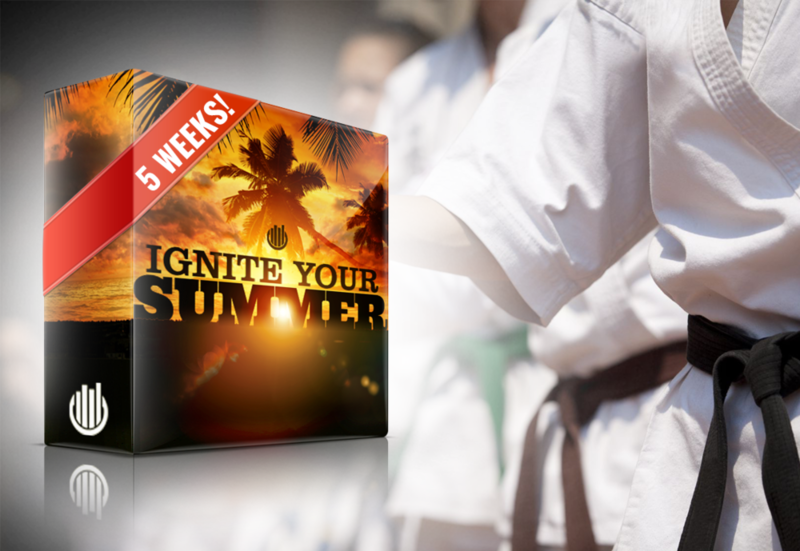 The kit provides you with 5 weeks of material so you can ignite the summer at your school. This kit features different themed drills for your class, Facebook images for advertising, and themed music mixes as well. And the best part is that you do not have to change what you are currently doing at your school. Each drill is only five minutes in length and is best used to end your class with a bang! Your students will be leaving with smiles and will already be looking forward to the next class. We have also included special tutorial videos for each drill below. Below, you can download our POWER UP! Parents Night Out Action Kit. Parents Nights Out (PNO'S) are great ways to help your students build friendships within your school. It is also a great way for your students to build better rapport with your instructors. And the best part? It adds tons of value for the parents at your school! Parents will be thanking you in no time. Why should I host a Parents Night Out? Numbers don't lie. We have used the systems that are being given to you at our school for 2.5 years. In those 2.5 years, we have sold out EVERY SINGLE PNO. That is 30 students and 10-15 guests every month for 2.5 years. Most of those PNO's sold out in less than 5 days! We charge our students $25 and allow them to each bring a guest for free. What about siblings? We allow siblings to come for half price. We charge for these and Parents still thank us at the end of every PNO. While making a profit isn't the main focus of a PNO, it is a nice added bonus. We make about $500 per PNO or an extra $6000 per year. Does it work for other schools? We currently have 43 clients that are using this PNO system ever month. Over 75% have been selling out their PNOs in record time while saving time and stress. One of the most important qualities of an entrepreneur is that they constantly grow their knowledge base. If you aren't on a quest for knowledge, you are probably standing still. Stay up to date with some of most important trends in the martial arts industry. The Level Up Lounge Podcast has featured some of the top martial artists and entrepreneurs in the industry including Dave Kovar, Jadi Tention, Barry Van Over, Jesse Encamp (Karate by Jesse), Nick D, and more! This is a free resource that you can listen to while in your car or the office. Check it out below! If you liked what you downloaded, feel free to join our Facebook group below. We will be having more free content available this upcoming week for all school owners in our group. If not, that's okay too. Thanks for checking us out!